The First Battle of the Marne (also known as the Miracle of the Marne) took place in 1914, near the Marne River, close to Paris. 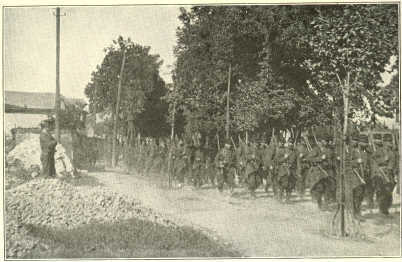 In the weeks leading up the Battle of the Marne, German forces had swept through Belgium and were poised to take Paris. French and British troops were withdrawing, but there was poor communication and even poorer relations between the allied commanders. The British commander threatened to withdraw his troops from the front lines, which would have likely collapsed the entire allied front. In Paris, the population prepared for a siege similar to the one that the city had endured during the disastrous war of 1870 against Prussia and the German States. However the Germans allowed a gap to develop between their main corps, which was discovered by allied scout planes. 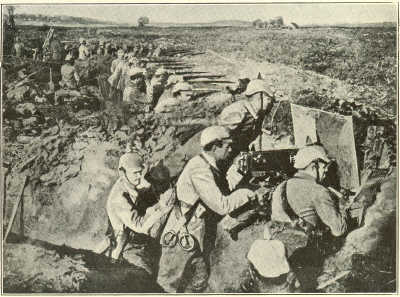 Profiting from the German's tactical error, the allies launched a counter attack which pushed the Germans back to fortified positions behind the Aisne River. The allied victory at the Marne was to prove a decisive set back for the Germans. 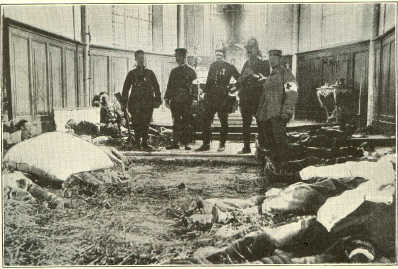 After the battle the German commander, General von Moltke, is reputed to have reported to the Kaiser: "Your Majesty, we have lost the war." Following the First Battle of the Marne, both sides dug in and four years of stalemate ensued. The allied counter attack that turned back the German offensive was aided by 600 Paris Taxis that ferried reserve troops from the City of Paris to the front lines. Over two million men fought on both sides, in the First Battle of the Marne, of whom more than 500,000 were killed or wounded. 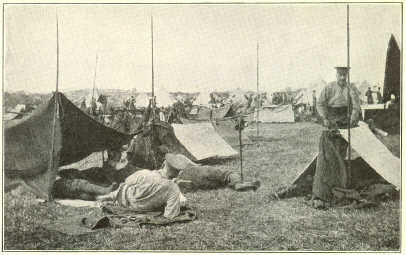 The casualties during the Battle of the Marne were the highest sustained in a single battle for the rest of the war. Below is a collection of World War 1 photographs showing the fighting on the Western Front during the First Battle of the Marne. 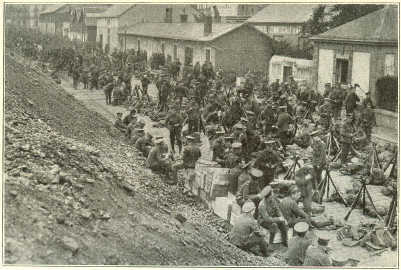 On August 22, 1914 the French 5th Army was defeated at Charleroi. 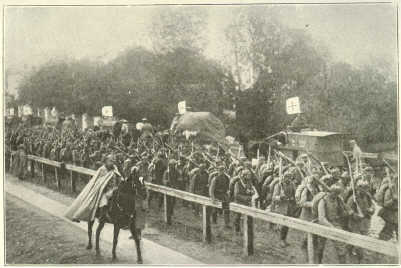 The French troops which had formed for battle along the Meuse and Sambre had been organized into five "Field Armies," numbered from right to left. 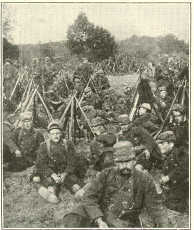 When the 5th Army was driven back from the Sambre, the British and 4th French Armies found their flanks uncovered and were obliged to retreat. In the same way the retreat of the 4th Army necessitated that of the 3rd. The right flank of the latter, however, was protected by the great fortress of Verdun. One of Napoleon's four strategical maxims was "always maneuver about a fixed point," and there can be no doubt that Verdun was General Joffre's "fixed point." Verdun was the centre on which the whole forces north of it pivoted as they fell back through an angle of 90 degrees until the British on the left of the line had reached the northern outworks of Paris. Meanwhile, a new 6th Army, which had been secretly concentrated in Paris, was brought up on the British left; and a new 9th Army was formed and brought up into the French battle-front between their 4th and 5th Armies. Thus did the Battle of Charleroi influence the position of the Franco-British line between Paris and Verdun during the Battle of the Marne. A BRITISH COLUMN HALTS BY THE WAY. 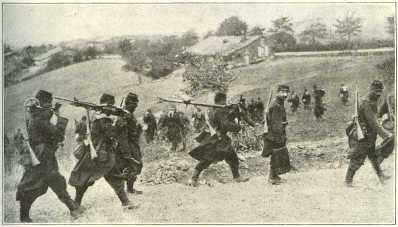 The Germans had advanced from Mons to near Luzarches. On August 31 they were as near Notre Dame as Tilbury or Staines, is to St. Paul's Cathedral in London. 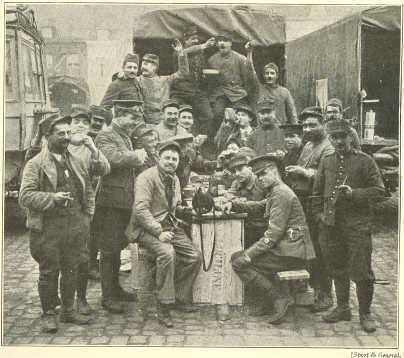 The Military Governor of Paris, wishing to be rid of "les bouches inutiles," had invited the citizens to leave, and nearly a third of the population had departed and the Government had withdrawn to Bordeaux. But, not only was the line of the Meuse heavily fortified, but the adjacent country was very hilly, covered with forests separated by strips of pasture land studded with spinneys and copses, traversed by hedges and broken by ravines. Running north and south parallel with the terrain of the Meuse, and separated from it by a comparatively narrow and broken valley, was the long forest-clad hill-barrier of the Argonne ending at Triaucourt and con� tinued southwards by a line of lakes and vast forests. In all these regions the population was comparatively sparse, supplies scanty, roads and railways few and far between, which prohibited the operations and supply of a large force, and nothing but a large force could hope to break the French line. 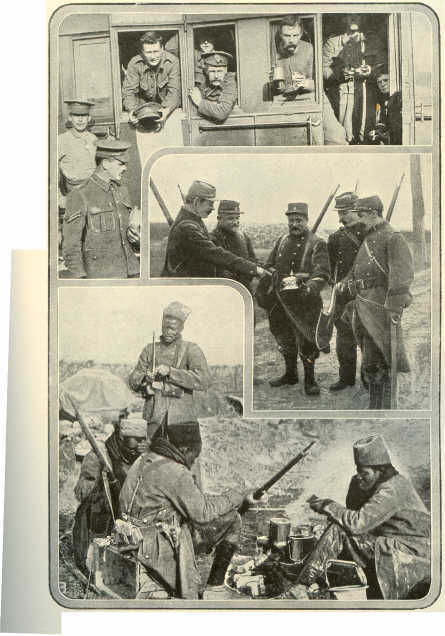 Morroccan and other French colonial troops fought in France during the First World War. The British also made use of their colonial levies and many soldiers from Canada, Australia, New Zealand, India and South Africa fought in Europe during World War 1. 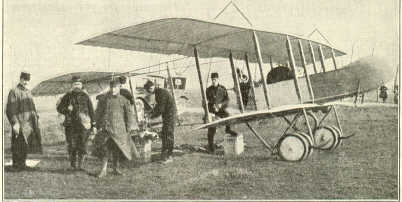 Both sides used airplanes during the Battle of the Marne. The allies air reconnaisance was responsible for spotting a weakness in the German lines which was exploited by the allies in a counter attack that stopped the German advance and forced the German army to retreat behind the Aisne River. As a result, Paris was saved. 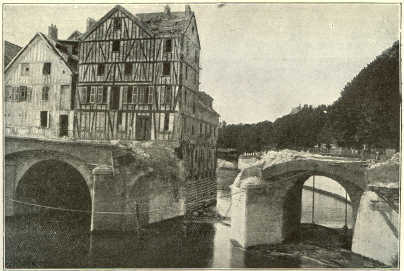 The Pont du Moulin, destroyed by French Engineers in an effort to slow the German advance. These Trenches were abandoned by the Germans as they retreated in the face of allied counter attacks. GERMAN SOLDIERS IN THEIR TRENCHES. In the foreground is an Officer superintending the sighting of a machine gun. Zouave was the name given to certain North African infantry regiments in the French army, as well as to units in other armies which imitated the dress or drill of the French zouaves. 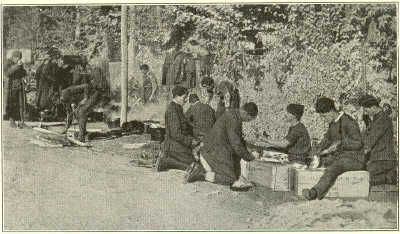 The Zouaves of the French Army were first raised in Algeria in 1831 with one and later two battalions, initially recruited solely from the Zouaoua (or Zwawa), a tribe of Berbers. 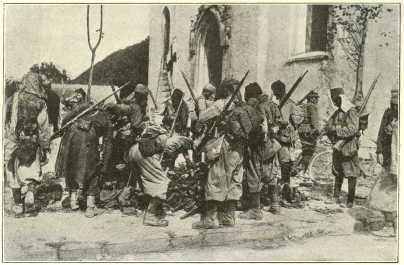 The 5th French Army, greatly assisted by the British operations, attacked the enemy fiercely, stormed Montmirail and two other villages by hand-to-hand fighting, and established itself on the Petit Morin. 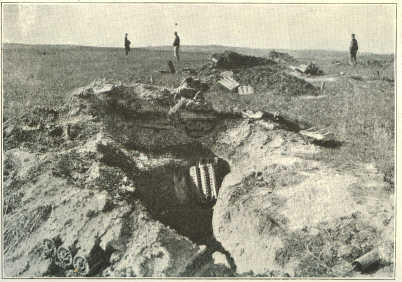 The flank of the 2nd German Army being now uncovered, was obliged to withdraw, and the 9th French. Army was enabled to advance its left and centre to the line of the Petit Morin. 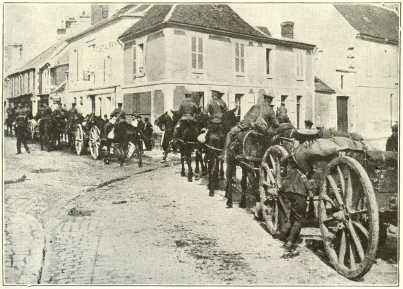 FRENCH TROOPS. An hour's respite. 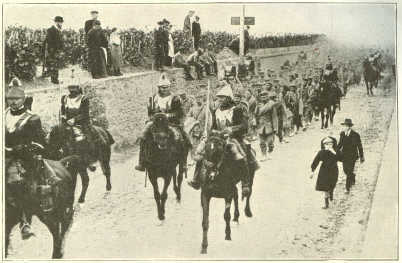 Turcos were French colonial Muslim troops. Many fought in France for the French Army. 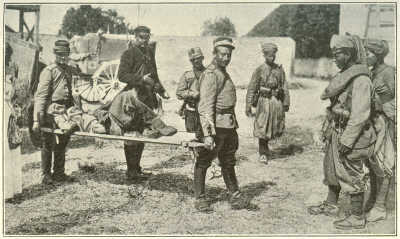 WOUNDED TURCOS BEING CARRIED IN BY FRENCH HUSSARS. 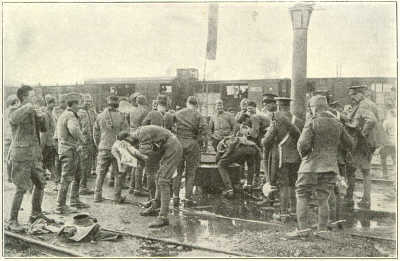 GERMAN TROOPS PASSING RED CROSS WAGONS WITH WOUNDED RETURNING FROM THE BATTLEFIELD. There was a certain amount of hand-to-hand fighting with small bodies of German troops who had been unable to retreat across the river in time. 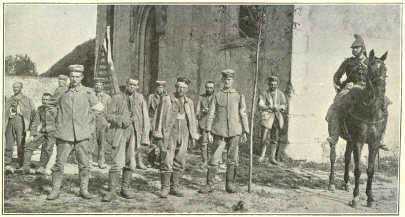 By Tuesday night the British were in possession of Chateau Thierry. Near Chateau Thierry there was more fighting. The road runs straight across the Plain of Chezy before it plunges into the dark shadows of the Grande Foret. 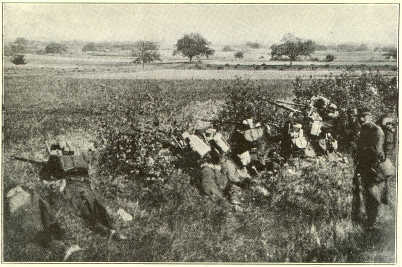 As soon as the British infantry entered the woods it could be no longer supported by their artillery, and the fighting developed into an immense hunt, in which the British pursued the Germans from tree to tree, capturing them in little blocks every here and there, and making a rather larger haul of a number of the enemy who were cut off by the marshes of Hotisseaux and Bergis. Just beyond Chateau Thierry itself the Germans had left a considerable rearguard with a few large guns on the heights above the town. As the British approached they came first under the fire of these heavy guns. 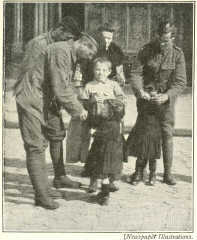 Some of them pushed into Chateau Thierry itself, with the result that many of the houses were destroyed by shell fire. 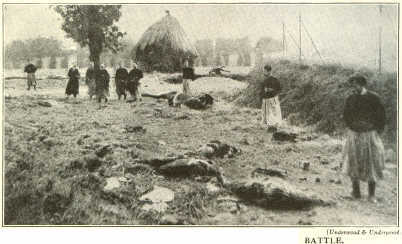 The fronts of the houses on the road towards Soissons were fmrowed deep by flying shot and shell; their sides in many cases presented gaping holes; tne tall trees which lined the road had been stripped of their leaves, and often topped and lopped by shell fire; the beautiful country around was burnt and charred. Here and there individuals or groups of Germans were forced to surrender-often under circumstances which suggested that they had been left without much hope of avoiding capture, in order to secure the safe retirement of their main body.